Th expense report template is a free template that a business can use to record any expenses that it might have through the year. The template lets you enter your monthly expenses as well as the revenue that you take in so that you can compare how much money you are spending to how much you are making. You can compare expenses each month or on a quarterly basis. 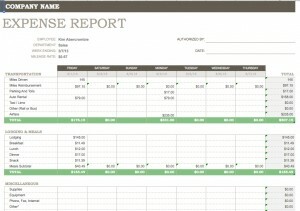 Who Can Use an Expense Report Template? Large businesses that have multiple expense accounts would benefit from this type of template. They could keep up with which business needs to be paid first so they don’t have to pay larger interest fees.